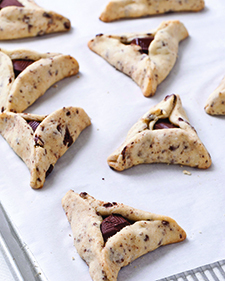 These hamantaschen are made with chopped chocolate in the dough as well as in the filling and taste like your favorite chocolate chip cookies. This also means that they are best eaten straight out of the oven. 1. In a large bowl, mix together the eggs, sugar, oil and vanilla. Add the flour and salt and mix until the dough comes together. Gently mix in the chopped chocolate. Cover the bowl with plastic wrap and leave in the fridge for one hour to firm up. 2. Preheat oven to 350° F. Line large cookie sheets with parchment paper or silicone baking mats. Divide the dough in half. 3. Take another two pieces of parchment paper and sprinkle flour on one, place one dough half on top, and then sprinkle a little more flour on top of the dough. Place the second piece of parchment on top of the dough and roll on top of the parchment until the dough is about 1/4-inch thick. Every few rolls, peel back the top parchment and sprinkle a little more flour on the dough. 4. Use a 2- to 3-inch drinking glass or round cookie cutter to cut the dough into circles. Use a metal flat-blade spatula to lift up the circle of dough and place it on another part of the flour-sprinkled parchment paper. Place one, 1/2-inch square of chocolate or 7 chocolate chips into the center and then fold the three sides in toward the middle to form a triangle, leaving a small opening in the center. Pinch the three sides together tightly. Place on the prepared cookie sheets. Repeat with the remaining dough and roll and cut any dough scraps, making sure to sprinkle a little flour under and over the dough before you roll. 5. Bake for 14 to 16 minutes, or until bottoms are lightly browned but tops are still light. Slide the parchment paper onto wire racks to cool the cookies. Store in an airtight container at room temperature for up to five days or freeze for up to three months. Reprinted with permission from The Holiday Kosher Baker (c) 2013 by Paula Shoyer, Sterling Publishing Co., Inc. Photography by Michael Bennett Kress. do you think these can be made gluten free? if so- what type of flour would you recommend- almond, etc?